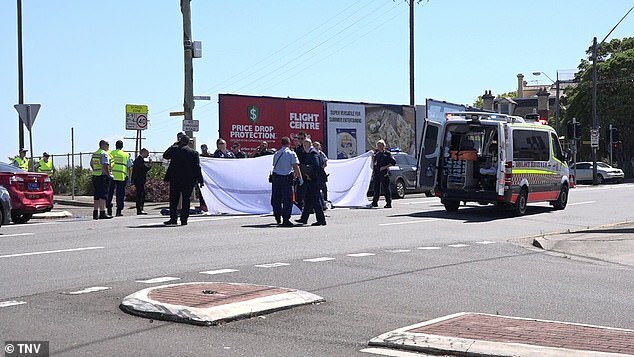 A man is dead after embarking on a crime spree which stretched across four Sydney suburbs – and saw a bystander knifed. 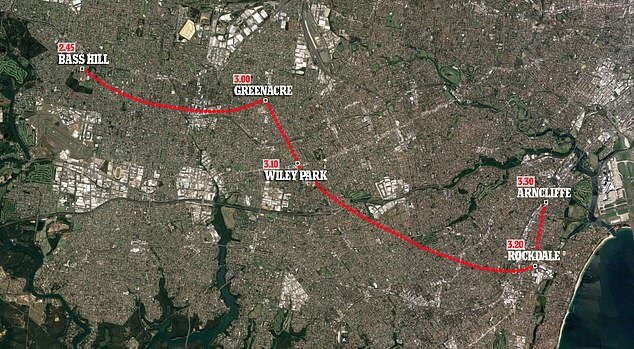 The chaos began when police tried to pull over the man on the Hume Highway in Bass Hill about 3pm on Friday as he wasn’t displaying number plates. The driver fled towards Wiley Park, ricocheting off at least four parked vehicles as he attempted to evade pursuing police. He was forced to abandon the Wooolworths truck after crashing into parked cars in Rockdale. 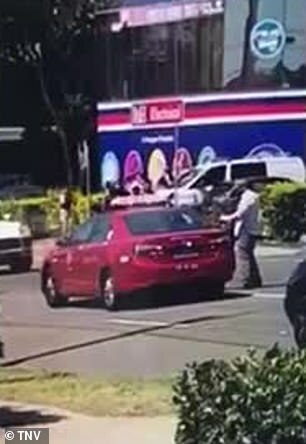 Emerging from the stolen truck the man began abusing bystanders in Arabic. 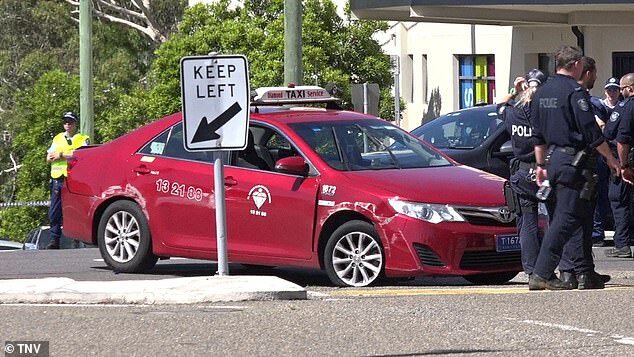 A 20-year-old man came out of the gym and tried to calm the driver down, but was instead stabbed in the stomach with a 25cm long kitchen knife, witnesses said. 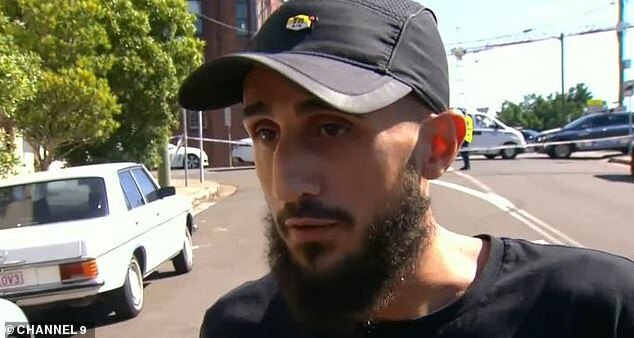 ‘It was the worst thing I have seen in my life, it was crazy,’ terrified witness Harry Magwawi told 9News, adding that watching the chaos unfold was ‘traumatising’. 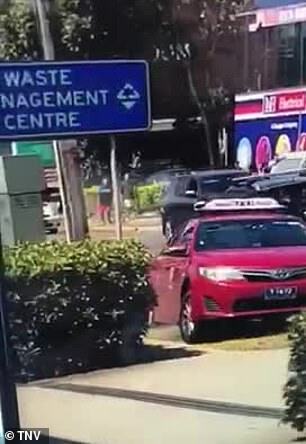 The assailant then hijacked a red taxi and fled the scene, with video posted to social media showing him take off on the wrong side of the road and mount the kerb. 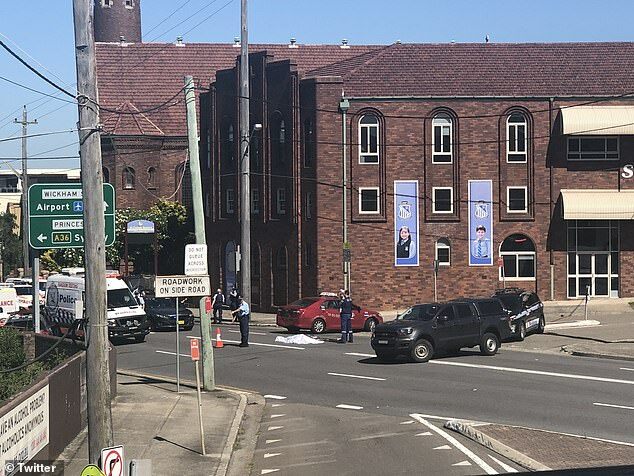 Police caught up to the assailant on Forest Road in Arncliffe about 3.30pm, near St Francis Xavier’s Catholic Primary School. 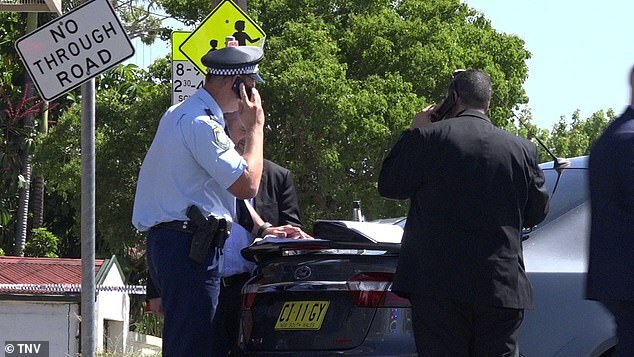 He got out of the car and rather than be arrested, repeatedly turned his knife on himself as police looked on in horror. 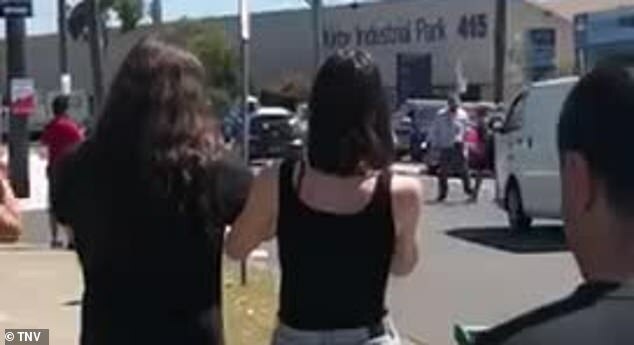 The families of both the alleged perpetrator and his victim spoke to Seven News following the chaos, revealing the victim’s family was ‘absolutely distraught’. The young man who was stabbed outside the gym remains in an induced coma in a serious but stable undergoing surgery in St George Hospital. 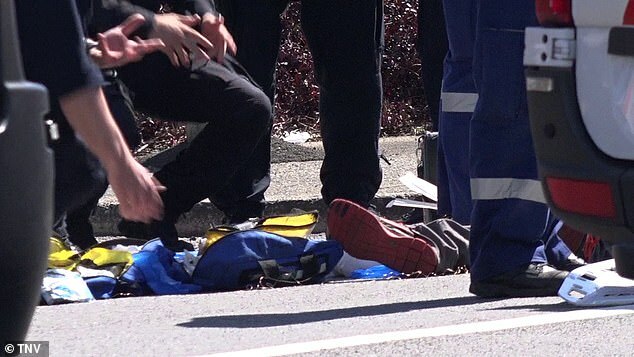 The knifeman was known to police and had a history of mental health issues, authorities said. 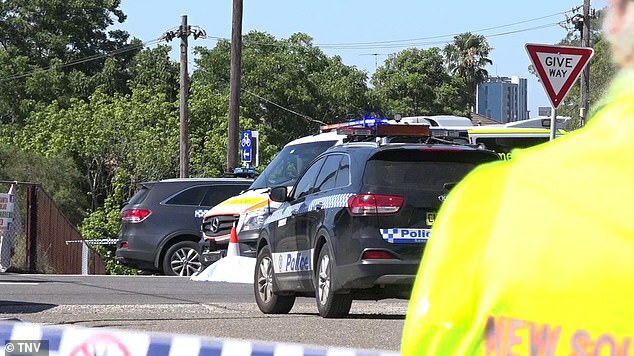 NSW Police Acting Assistant Commissioner Mick Fitzgerald said the man had a ‘mental health background’ but not an extensive criminal history. Chris Burton witnessed the Rockdale stabbing and went to the victim’s aid as he lay on the gorund in a pool of blood. ‘He was laying there, like, ‘I’m going numb’. It was a good knife. It went all the way in,’ he told 10 News. 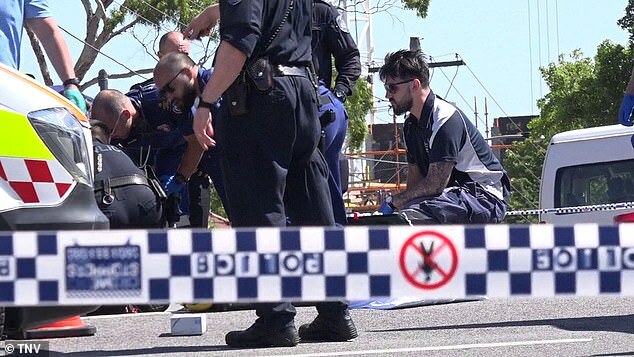 West Botany Street remains taped off and police are interviewing people at the scene.